659 people are playing standard multiplayer and 68 people are playing Zombies mode on Wii U. More than last week. For comparison, there are 511,529 people playing standard multiplayer and 124,321 people playing Zombies mode in Black Ops II on Xbox 360. Of course, it's not fair to directly compare a console that launched last week with a console that's been around for six years. So let's do some math. Microsoft has sold 70 million Xbox 360s worldwide to date. 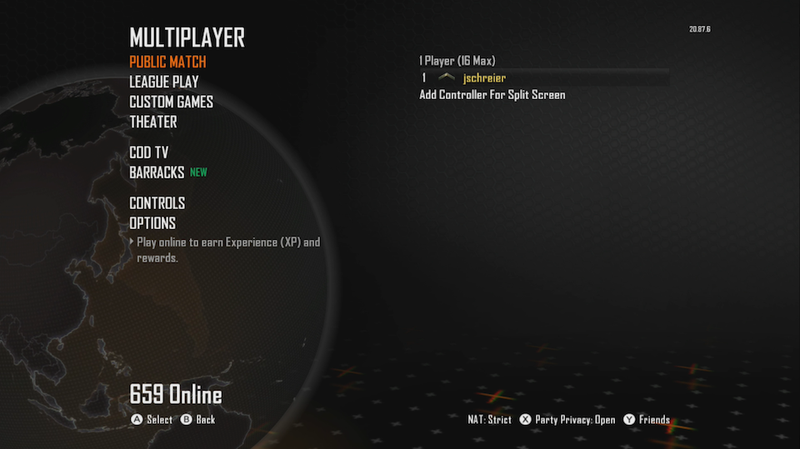 If you take that 635,850 number (total multiplayer + zombies) and divide it by 70 million, you get a ratio of 0.009, which means that 9 out of every 1,000 people with Xbox 360s are playing Black Ops II as I write this. Nintendo has sold 400,000 Wii U consoles in North America to date. (It hasn't been released anywhere else.) If you take 727 and divide it by 400,000, you get a ratio of 0.0018, which means that a little under 2 out of every 1,000 (or 9 out of every 5,000) people with Wii U consoles are playing Black Ops II as I write this. As for Madden, well... Madden doesn't even have enough online players to complete a football team. We'll continue to check this out regularly at different days and times just to get an idea of how many people are playing at any given moment. And by the way, if you've seen exponentially more people playing at one specific time, let us know below.